This is a rectangular Enameled Steel Signs porcelain sign. This particular Enameled Steel Signs sign is very colorful and features several examples of different words and shapes the company can produce. 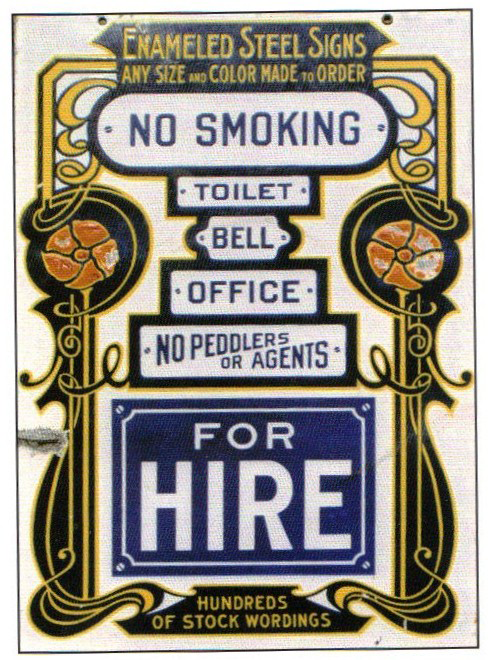 It reads, “Enameled Steel Signs, Any Size and Color Made To Order, No Smoking, Toilet, Bell, Office, No Peddlers or Agents, For Hire, Hundreds of Stock Words” and features a very decorative art nouveau flower border.